According to Bernanke’s book, the manipulation of interest rates was a success because there was no dollar collapse and no runaway inflation. 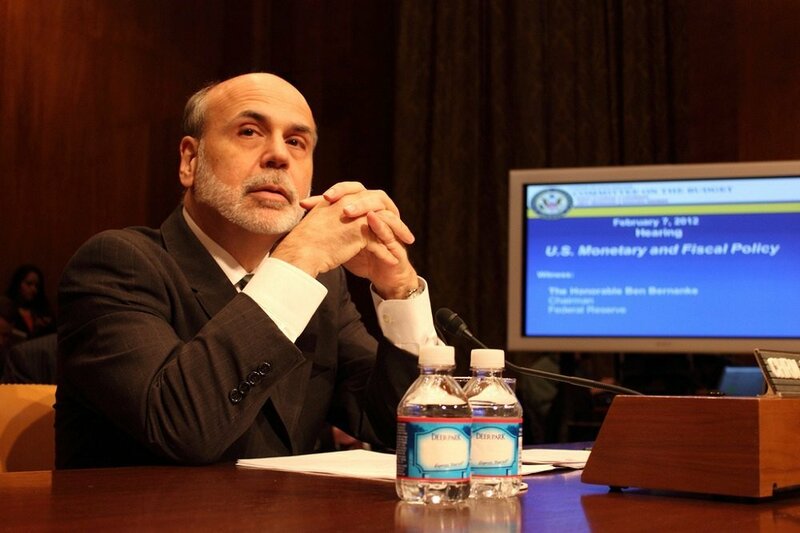 Former Fed Chairman Ben Bernanke’s book titled “The Courage to Act” is now available in paperback. This isn’t a surprise because, after all, his proclivity to print paper encompasses the totality of what his courage to act was all about. The errors in logic made in his book are too numerous to tackle in this commentary; so I’ll just debunk a few of the worst. Bernanke claimed on one of his book tour stints that the economy can no longer grow above a 3% rate due to systemic productivity and demographic limitations. But his misdiagnosis stems from a refusal to ignore the millions of fallow workers outside of the labor force that would like to work if given the opportunity to earn a living wage. Mr. Bernanke also fails to recognize the surge of productivity from the American private sector that would emerge after the economy was allowed to undergo a healthy and natural deleveraging cycle. Also, the former Fed Chairman should learn a lesson from history. According to Former OMB Director David Stockman, the three-year stretch from 1983 to 1985 during the heart of the Reagan boom, growth in the U.S. economy averaged over 5.5% per year. Reagan also enjoyed a rising dollar, falling inflation, lower taxes and tumbling interest rates. All that is needed to grow the U.S. economy above the 3% threshold is to boost productivity; but the only way to accomplish this is to first deleverage the economy from its record 350% debt to GDP ratio, which would fix the broken savings and investment dynamic. Therefore, the best way to lift the economy out of its debt-disabled condition is to reverse Bernanke’s foolish “courage to act” in regards to the record breaking and massive distortion of interest rates he imposed on the economy. But according to Bernanke’s book, the manipulation of interest rates was a success because there was no dollar collapse and no runaway inflation, as many Austrian economists had predicted. However, the only reason there was neither of each is that our major trading partners followed Bernanke’s lead and performed the very same QE and ZIRP utilized by the Fed. Nevertheless, what Bernanke did create is a triumvirate of asset bubbles extant in bonds, stocks and real estate that cannot be undone without first crippling the economy. And the Fed’s allure of virtually free money for eight years engendered the accumulation of a record amount of new debt that still needs to be unwound. Therefore, the primary retardant to growth isn’t the current level of tax rates, unlike what the new Republican regime would like you to believe. In fact, the effective corporate tax rate is just 14%. The salient and impending danger lies in the precarious position of asset bubbles and leverage that will lead to unprecedented interest rate volatility and market chaos in the near future. What Bernanke also appears happy to overlook is that our over-leveraged economy has eviscerated the American middle class by robbing savers; and saddling them with stagnant real wages and a reduced standard living. Indeed, the truth is the Fed not only delayed a depression in 2008 but also rendered the economy into a condition of perpetual stagnation. The pitiful 2% annual GDP growth rate experienced since 2010 has now slipped below 1%. The economy only grew at 1.6% during all of 2016 and just 0.7% during Q1 2017. SEE ALSO Is the PayPal stock (PYPL) anxious about a correction? Looking forward to the remainder of 2017, we find that commercial and industrial loan growth is rolling; over along with distress in student, auto and credit card assets. And even the grossly distorted data from the Bureau of Labor Statistics (BLS) is faltering. April BLS jobs data showed a sharp slowdown in the Household Survey to just 156k net new jobs created, down from the 472k figure in March. Studies have proven data from the Household Survey leads that of the Establishment Survey during inflection points of the economy. This is what we see now; in addition to a global banking crisis that is already fracturing in China, Japan and in Europe. It’s really just common sense; artificially-low interest rates, asset bubbles, and over-indebtedness cannot be fixed by simply printing money like it is confetti. But the worst news is the efforts that began under Mr. Bernanke have merely delayed the inevitable depression that will only be exacerbated by the increased precipice from which asset prices and debt levels must now fall. For those investors who have yet to seek protection for their portfolios from the coming reality check, the courage to act is now.